A simple tool for making travel planning easier. While it would be nice to do nothing but travel and plan trips with Planapple full time, most of us have busy lives filled with work, family, and social appointments. There are lots of great, free, calendar programs out there to help us keep track of these crazy schedules such as Google Calendar and Apple iCal. Wouldn't it be great if all of your Planapple trip plans automatically appeared in your main calendar program so you could keep track of them there along with everything else? 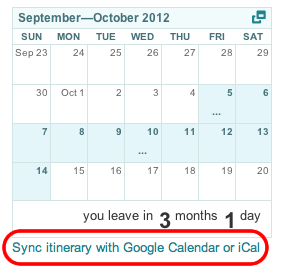 As of today, Planapple's new "Sync Itinerary" feature makes this easy. 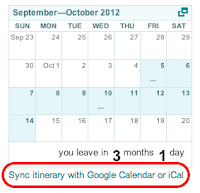 Once you've added start and end dates to your trip, click on the "Sync itinerary with Google Calendar or iCal" link under the calendar widget on the right side of the main trip page. This will bring up a dialog with a special link that you can copy and paste into most calendar programs. This will let them import all of your scheduled Planapple trips and itineraries as a shared calendar. (For those who are curious, the link is called an iCal Feed which is like an RSS or news feed for your calendar). Visit planapple.com to start planning your next trip instantly. Planapple Blog. Simple theme. Powered by Blogger.